Matt was born in Pittsburgh, PA but raised in West Chester, PA a suburb of Philadelphia. He attended West Chester East High School and was a letterman in football, basketball, and baseball. Matt went on to attend the University of Virginia, where he graduated with a degree in Economics. He finished his college career with at least 22 school records. He played in a record 40 games at the quarterback position and finished his career as one of the most accurate passers in Atlantic Coast Conference history. Matt is now signed with the Baltimore Ravens. He was drafted by the Atlanta Falcons in the third round of the 2004 NFL Draft. 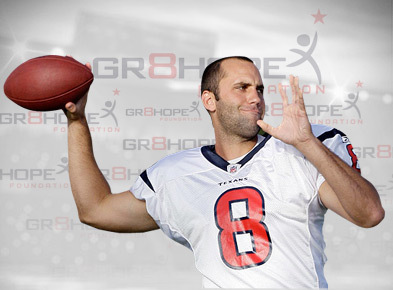 Matt was traded to the Houston Texans in March of 2007. He was selected to his 1st Pro Bowl following the 2009 season where he was the game’s MVP. He played for the Oakland Raiders in 2014. Dance instructor and mother, was born and raised in Birmingham, AL. She graduated from Thompson High School in Alabaster, AL. She then attended Auburn University where she earned a degree in Health Promotion, with a business minor. Laurie moved to Atlanta, GA in 2004 in order to work for Lehman Brothers. While in Atlanta, she cheered for several years with the Atlanta Falcons. Matt and Laurie were married in February 2008 and are now proud parents of Madison, Mathew, and twins, Makayla and Mackenzie. Laurie serves on the board of the Make-A-Wish foundation in Houston, and is a member of the YTAC (Young Texans against Cancer) and The Lady Texans, an organization formed by the Houston Texans players’ wives that helps out in the community wherever necessary, such as hosting annual food drives.